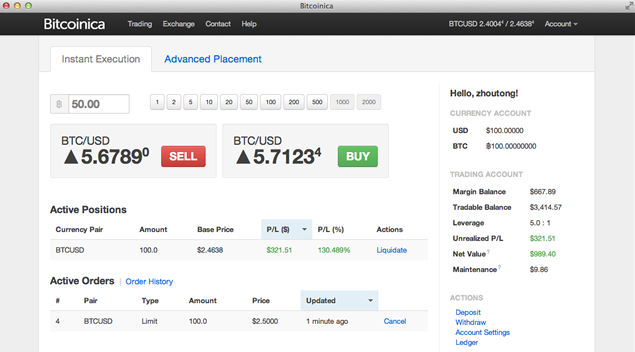 Bitcoinica users who have a balance in the service are likely safe. Bitcoinica’s staff is building an account claim page, and the latest news is that users will receive all of their money back, with their US dollar balance liquidated at a settlement price of 4.94-4.98. Bitcoinica itself has, as of two weeks ago, been taken over by Intersango, and the use that the new leadership will put the platform’s code to, if any, is not yet certain. Many will disagree with him about the social utility of financial speculation services; there is an argument to be made that it promotes price stability and, as the wide array of Bitcoin casinos shows, even negative-sum gambling has value in itself. But where Bitcoinica and Zhou brought the most value to the community has nothing to do with the service itself. Rather, Zhou showed us that the world of Bitcoin is a world where freedom and opportunity reign supreme, and where even a 17 year old with no prior connections can make a difference by virtue of his talent alone. In many ways, he represents Bitcoin’s everyman; the largely self-educated, highly independent individual with a wide variety of interests ranging from computer science to finance and economics to politics to philosophy seizing upon a chance to apply his talents to the world. One could even argue that he is an echo of Satoshi himself. Despite his position as the creator of a financial speculation service and his strong belief in libertarian capitalist ideals, Bitcoinica to him has never been about the profit. “Bitcoinica is not a money making machine,” he writes. “It’s just a product that sets a high standard for the Bitcoin community.” This is something that we all lose track of from time to time. The polarized political dialogue that we are forced to listen to every day on the mainstream media often forces those of us who support financial freedom to at least subconsciously align ourselves with the likely nonexistent ideal type of an individual who cares about nothing but short term wealth, but ultimately, as none other than Ayn Rand pointed out, money is only a tool. It is indeed a very good tool, allowing us to enjoy the products that come out of a highly specialized economy characterized by the division of labor, command services from individuals halfway across the world with whom we have had no prior contact whatsoever and invest for the future without tying ourselves down to a specific project, but it cannot replace the personal drive and vision that is at ultimately the core of both great businesses and projects like Linux, Wikipedia and even Bitcoin itself. Zhou Tong has often been reviled as a scammer, and this crisis has, predictably, only amplified such cries. But his actions over the past eight months do not paint the picture of a man who consciously set out to defraud the public with a Ponzi scheme or an arcane system of liquidation rules; rather, they paint the picture of a teenager, still uncorrupted by the rigidities of the status quo, ready to discover the world and find a place where he can make a difference. Of course, Bitcoinica’s history is marked by security blunders and telling signs of Zhou’s inexperience. However, failure is an inevitable part of learning and innovation, and if the Bitcoin community begins to treat failure as an unforgivable sin and every blunder as proof of moral turpitude, then it will cease to be a community that values learning and innovation at all. Instead, it will become yet another manifestation of the inflexible and bureaucratic status quo. The Apollo program killed three people before it got a single one on the moon, and Socrates’ contributions to philosophy would never have appeared had he listened to his detractors’ complaints that he was corrupting the youth. Rather than disparaging Zhou for being too inexperienced to succeed, we should be praising him for daring to try. While his first endeavor has now failed, and even his second may fail too, perhaps his third might succeed, and in our world of unlimited growth and infinite possibility the amount that we all gain from one great success outweighs the disappointment of even a hundred failures. Lastly, although this first implementation of Bitcoinica may have died, the idea has not. The demand for a service like Bitcoinica has been proven to exist, and it’s only a matter of time until it resurfaces in some other form. Ringcoin’s new Kronos.io will soon provide an even more secure alternative by using its ZipConf instant Bitcoin transfer technology to remove the need to have a potentially vulnerable “hot wallet” at all, and more competition may be around the corner.